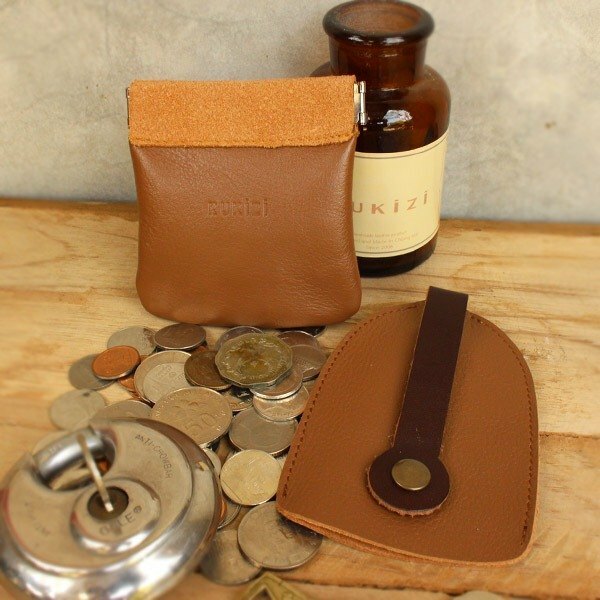 Coin Pouch/Coin Purse & Key Case 1. Coin Pouch can also keep earphones/ headphones or iPhone Lightning USB cable / small power adapter Compact size -- slips easily into any of your pockets To Open : Squeeze the frame spring , easy to open & close , your coin will not drop for sure. ** Notice : please don't squeeze it hard until the side of spring are too close or you will broke the spring. Size : 8 x 9.5 cm. Color : Tan **Please allow for some variation in color as displayed on different devices and screens. Actual colors may vary. Material : Genuine Cow Leather (Nappa Leather) , Metal Spring 2. Key case - Bell Shape with Leather Strap to keep the keys inside Beautiful Color , Soft touch Genuine Cow Leather. Closes with a snap button Preventing your keys from scratching table tops, your pants pocket or things in your bag. Size : 8 x 11 cm. Color : Tan **Please allow for some variation in color as displayed on different devices and screens. Actual colors may vary. Material : Genuine Cow Leather (Nappa Leather + Vegetable Tanned Leather Strap) , Snap Button Expected Delivery Date : For Taiwan , Hong Kong and Macau destination, your orders are estimated to arrive within 7-14 business days.